As expected, the Reserve Bank of Australia kept interest rates unchanged at 2.50% in today’s monetary policy decision. Governor Stevens and his men also retained their neutral stance, reiterating that “a period of stability” in rates is likely. In their previous rate statement, Stevens highlighted the weakness in Australia’s labor market and domestic economic activity. This time around, the RBA Governor dropped this downbeat assessment and focused on the green shoots. He noted that there are “signs of improvement in investment intentions,” signaling a potential expansion among businesses. Stevens also spoke of the pickup in the housing industry, as dwelling prices showed signs of stabilizing. With that, it’s no surprise that AUD/USD reacted positively to the event, rallying by more than 30 pips moments after the announcement. However, Stevens also emphasized that the Australian dollar’s appreciation is still taking its toll on economic performance. In particular, he mentioned that the Aussie remains high by historical standards and might be partly to blame for the decline in commodity prices. After all, iron ore has chalked up its sixth consecutive monthly price drop, which doesn’t look too good for mining industry revenues. Bear in mind that this is Australia’s largest commodity export and that prices have fallen by 1.3% in April, taking it down by 12.5% on an annualized basis. Also, as I predicted in my central bank preview for this week, the RBA also expressed its concerns about possible budget cuts, as the government tries to adopt measures to trim its growing deficit. Recall that the Australian government recently announced spending cuts on welfare, higher education, healthcare, and pensions – all of which could result to lower disposable income, weaker domestic demand, reduced government spending, and eventually a slowdown in growth. In a nutshell, the RBA rate statement was more or less a balanced one, with policymakers acknowledging the recent developments in hiring and housing while expressing caution about the potential threats to growth. 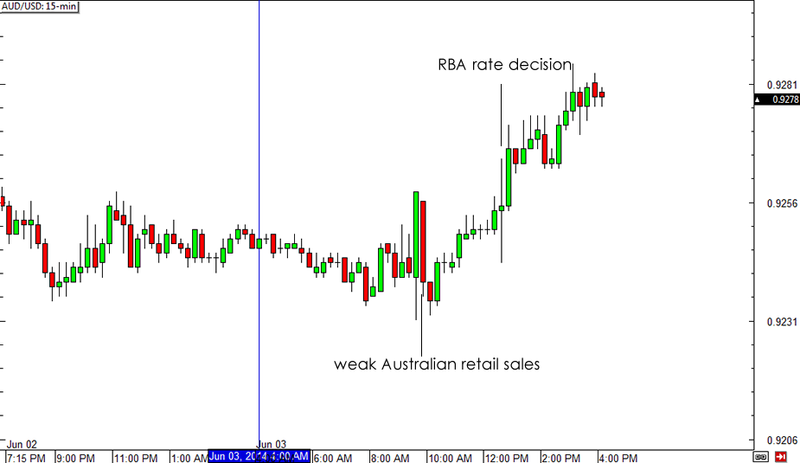 How long do you think will the RBA stick to its neutral stance?